I wrote the notes for three volumes of this music, all of it being released for the first time in late 1999 and early 2000. 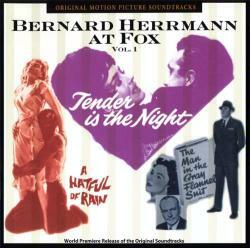 Volume 1 featured Herrmann’s Tender Is the Night (1962), The Man in the Gray Flannel Suit (1956) and A Hatful of Rain (1957). Volume 2 included Garden of Evil (1954), Prince of Players (1955) and King of the Khyber Rifles (1953). Volume 3 was entirely devoted to Anna and the King of Siam (1946). It was a fascinating assignment, thanks to producer Nick Redman and Herrmann biographer Steven C. Smith (whose book proved invaluable in providing musical insight).